Since Wegmans began stocking beer on their cafe shelves, I’ve become more and more interested in craft beers. I gave up on mass-produced corporate brews years ago for the tastier, more worthwhile beers produced by craft breweries and brewpubs. Naturally I began to read about brewing techniques, ingredients, and philosophies, and I picked up a subscription to Beer Advocate (which I highly recommend). All this led me to investigate the mystical realm of home brewing. I’m not very adept in the kitchen, so I was intimidated by a process whose success depended so much on accurate temperatures and timing and measuring and cleanliness. But my curiosity drove me on. I bought the book How to Brew by John Palmer, apparently the authoritative guide to home brewing. 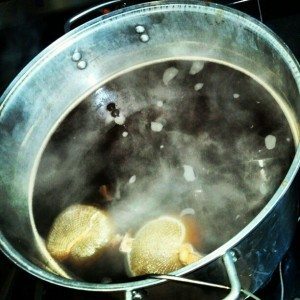 I began talking with friends about this interest, and eventually found out that a couple friends in my neighborhood were home brewers themselves, and were more than willing to show me the ropes and offer advice. This past weekend, I jumped right into it. A friend went to a fine home brewing shop in Cincinnati and brought back all the ingredients we needed to each brew a batch. He cooked up a brown ale, while I went bigger with an American IPA — which makes total sense, since I’m a complete newbie and have no idea what I’m doing. The process went relatively smoothly, and now there’s a big bucket in my basement bubbling away. Time will tell how this inaugural batch turns out — I could likely have 5 gallons of weird-tasting swill on my hands within the next month. But I’m really glad that I just went for it. 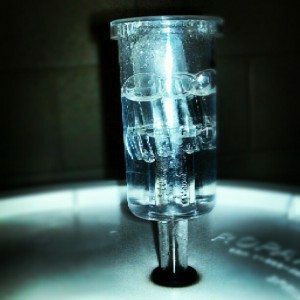 I really wanted to finish How to Brew first, read a few more issues of Beer Advocate, and get a good understanding for the whole process before I started. I’m glad I didn’t though. First of all, I learned an incredible amount in a single afternoon. Secondly, if I would have waited until I felt completely confident that I understood everything I needed to do, I may never have achieved that point, and consequently never have brewed anything.